Acne is one of the great equalizers in this life; it affects people at just about any age and from any economic status or lifestyle. You might hear about celebrities spending thousands of dollars on treatments only to continue suffering from acne and skin blemishes. Boston Common Podiatry, Skin & Wellness provides cutting edge Cutera XEO laser skincare treatments, over 20 aesthetic enhancement procedures that can help you achieve a clear and radiant complexion. 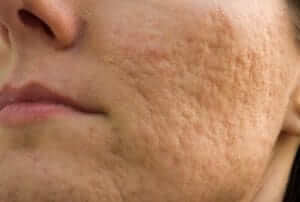 Acne scars are usually the product of an inflamed lesion (papule, pustule, or cyst). Inflamed blemishes occur when a follicle (or pore) becomes clogged with excess oil, dead skin cells, or bacteria (or some combination of the three). The pore will begin to swell, which causes a break in the follicle wall, resulting in acne lesions. Our laser acne treatment scar removal procedures achieve amazing results without having to resort to painful surgical treatments. The Cutera XEO emits high pulses of light precisely targeted into the dermis, eliminating damaged skin cells and activating your body’s collagen growth. As you heal, new radiant skin replaces the old. XEO represents Cutera’s first completely customizable workhorse, allowing us to perform over 20 different skin treatments, including acne and acne scars. With over 7 handpieces, our XEO system can cover a wide range of body areas and serve all skin types.